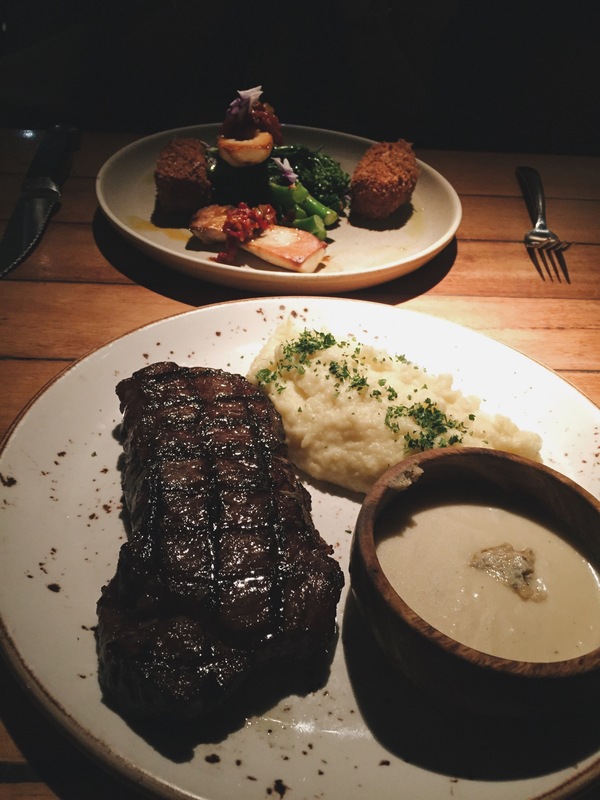 Valentine's Day at the Meat & Wine Co.: Review - like audrey. Ah yes, the one day where couples who have fallen into cozy home-netflix-eat routines can find a good reason to get out and appreciate each other’s company in a different environment. It’s kind of cute when you see people walking through the city carrying a lush bouquet of pink and red or you see a guy waiting on the side of the street with a rose in his hands. 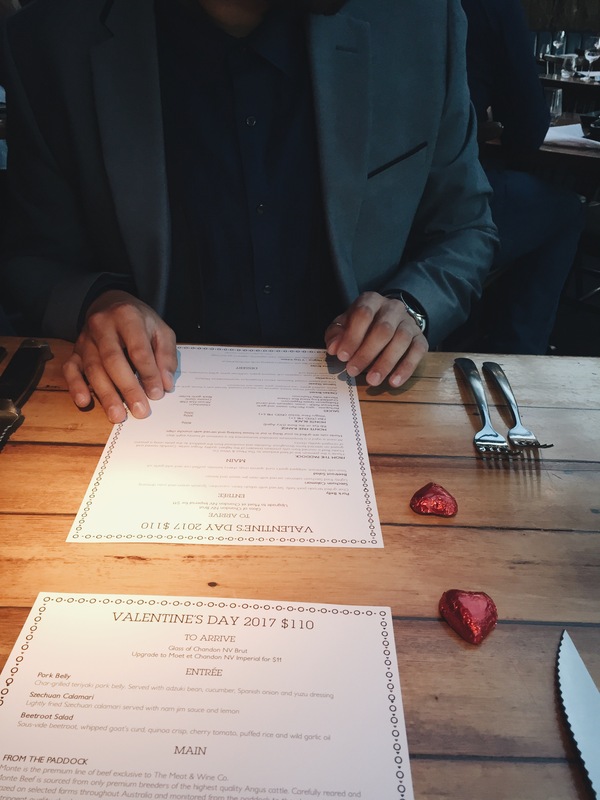 This year, we celebrated our 4th Valentine’s Day together at the Meat & Wine Co. 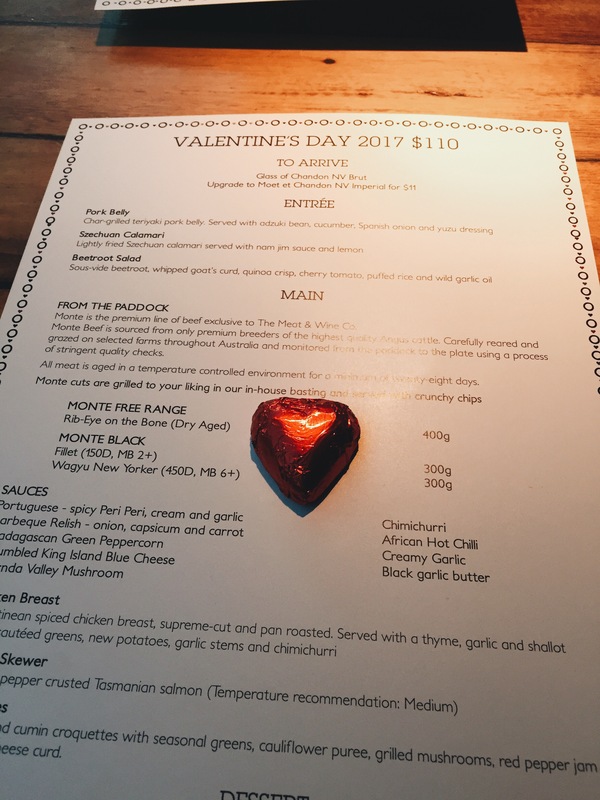 I didn’t realise at the time of booking but they had a special Valentine’s Day set menu on the night available for $110 per head. Though there was unfortunately no dairy-free dessert option, I was glad to see that there was a vegetarian option on the menu for both the entrée and main. Upon arrival we were served a glass each of Chandon and found two cute little red chocolate hearts waiting for us under our napkins. Despite it being a very cold night the temperature inside was set ideally so that neither of us were freezing or too warm. We were attended to quickly and the waiter was friendly and accommodating to my dietary requirements. For entrée, I went for the beetroot salad and Seb went for the pork belly (of course!). When the entrées came out I was super happy to see that the beetroot salad wasn’t a generic leafy coles-mix looking salad with a few pieces of beetroot thrown in. The presentation was impressive and I absolutely loooved the crispy quinoa chip on top! It made it much more exciting to devour and I enjoyed how the crunch from the puffed rice balanced out the softer texture of the diced beetroot. 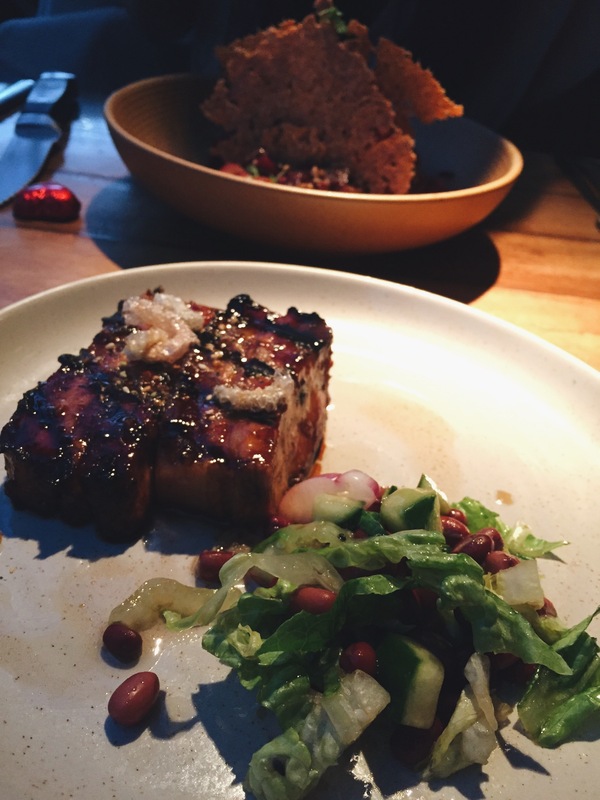 And…Seb finally got his pork belly after a week of no proper solid food post-wisdom teeth extraction! The service we received was very attentive but not to the point where we felt like we were being interrupted throughout our dinner. The portions and timing between courses were perfect and allowed for conversation to flow and for the both of us to not feel over-stuffed with food. Our mains were amazing. Enough said really. I ordered the chickpea and cumin croquettes and Seb got the Wagyu New Yorker steak. 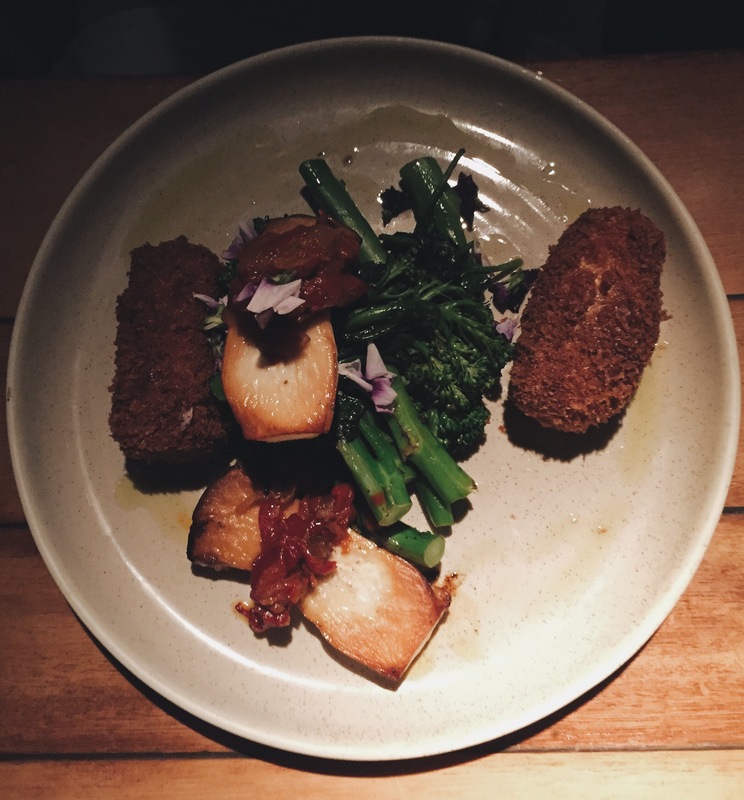 I have a huge obsession with all food that has heaps of spices and real warm earthy flavours and the croquettes fed right into that obsession. They were not dry or greasy at all and the crumbed coating was light and gave the perfect amount of crunch. The salsa was super yum – the only downside was that they didn’t give enough of it in my opinion for the size of the meal. A couple of days prior to Valentine’s day, the boo was struggling a bit to chew on fluffy pancakes so I was a little concerned about taking him to a restaurant to eat steak. Thankfully, he felt much better that day and said the wagyu steak he ordered was so soft and buttery that barely any effort was needed to cut through. By the end of the main course, we were both pretty content. What does a person who doesn’t eat dairy usually eat for dessert? Well, generally, we’re limited to pretty much fruit or sorbet. The waiter kindly organised for the kitchen to prepare a fruit platter for me, of which I did not take a picture because I felt too sad seeing this fancy dry-iced raspberry creation sit across the table from me. The semifreddo looked kind of like a high-class skinned magnum but it also looked damn freakin amazing. 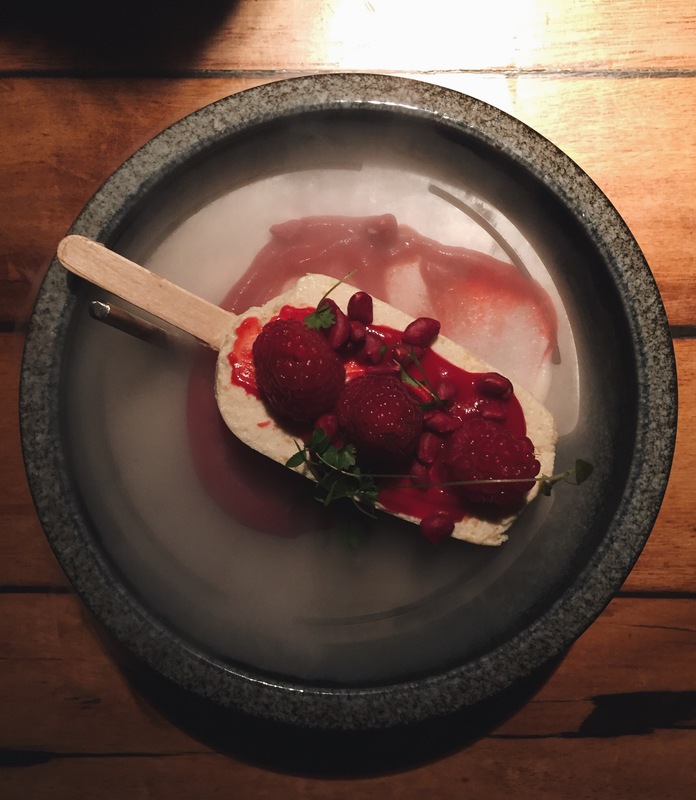 And dry ice? Come onnnnnnn that’s pretty cool.